� The Yosemite Valley plan, released three years ago and expected to cost about $440 million over a decade, is designed to improve visitor experience in the valley. Plans for a "more natural Yosemite" calls for an approximately 50 percent reduction in the number of rooms, cabins and campsites for overnight accommodation, the removal of historic bridges, roads and parking spaces at scenic spots, with parking centralized in a 550-car lot at Curry Village. This would help to reduce the effects of park crowding and traffic congestion. Because of parking space cuts, most visitors would be bused into the valley after leaving their cars in out-of-valley car parks. The plan is very much alive and being implemented, although a judge's ruling in November 2006 stopped construction projects, with an appeal pending. There are 15 projects that comprise the first phase of implementation, and these include a redesign of trails and approaches to lower Yosemite Falls, building a new Indian cultural centre, removing a dam on the Merced River and buying new shuttle buses. 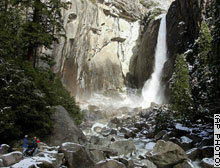 Visitors take in views of the lower falls at the newly restored Yosemite Falls area. � The Visitors Centre to be relocated out-of-valley close to the car parks. � The valley plan would return 176 acres along the Merced River to natural habitat and restore its floodplain. � Some camp sites and cabins removed from highly valued natural habitats such as river areas. � Stables and trail-rides reduced. � The only petrol station in the valley closed. � Park employees to be rehoused in accommodation outside the Park. � Admission fee increased from $5 to $20.